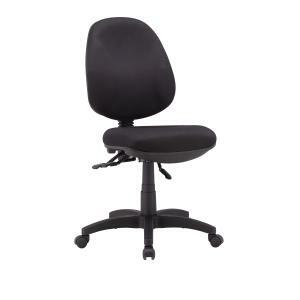 An extremely comfortable chair with a fully ergonomic 3 lever seat and back adjustment mechanism. The 3 lever mechanism allows each user to customise the seat and back to their individual requirements. The large seat offers superb comfort, while the height adjustable back enables optimal lumbar support. Free delivery is available on all furniture products shown as In Stock in the Winc Furniture Fundamentals Range with delivery to metropolitan areas in Sydney, Melbourne, Brisbane, Adelaide, Sunshine Coast, Gold Coast, Townsville, Geelong, Newcastle, Central Coast (NSW), Wollongong, Hobart, Launceston, Canberra, Darwin and Perth.